The Crystal of the Day for Saturday 26 October 2013 is Zincite. Zincite is a potent stone with powerful metaphysical property that energises your entire system and creates significant and powerful stimulation of all chakras. Its energy is an impressive aid for manifestation but it must be used in small doses. It is also a crystal known to stimulate and enhance your creativity. 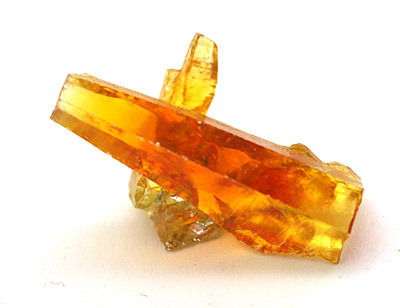 Zincite has an unusual and very potent energy. As soon as you hold the stone in your hand, most of you will feel its energy and make contact with it very quickly. This wonderful healing crystal is a impressive stone to use, for those who have been working on their higher chakras. It is especially useful if you have neglected to do much work within the lower chakras. If you have been mainly working with developing your spiritual or psychic gifts, it is easy to ignore the lower chakras. It is potent for spiritual grounding and it will ground you through the earth chakra very quickly. It will then return up the body and after stimulating the base chakra, sacral chakra and solar plexus chakra… it will move the energy up… through the heart chakra and link to the higher chakras. Light Green Zincite will energise the third eye chakra and the crown chakra to open you to high frequency energy which it then brings back down to the lower chakras. This process happens quite quickly, in only a few minutes. It is powerful for manifesting your visions from your third eye which is where you form ideals in your imagination. 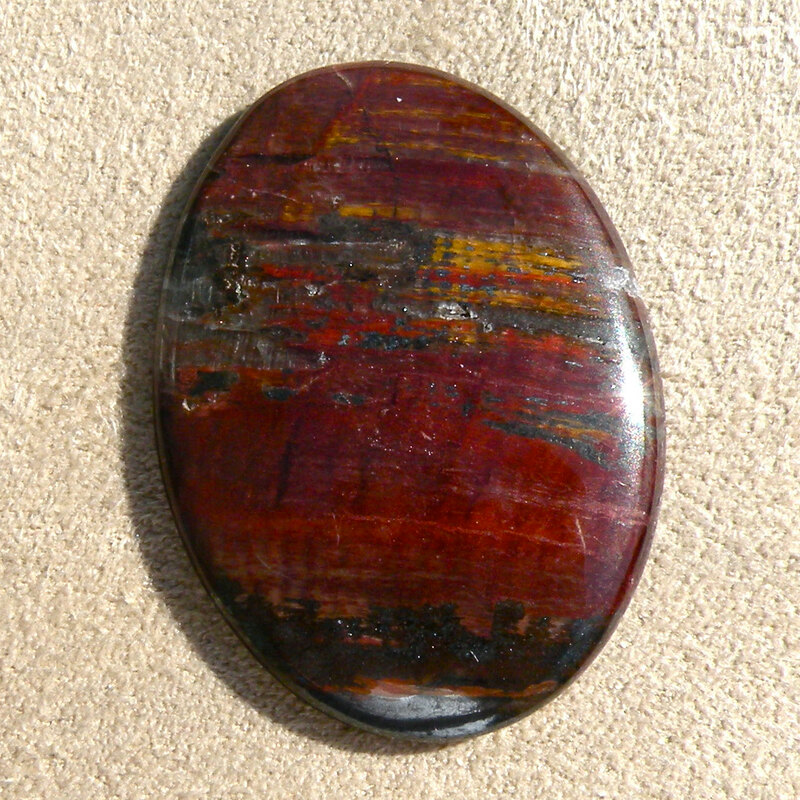 This stone may enhance your creativity through the power of its energy to unlock your imagination. Use these visions that you have conceptualised within your higher chakras by using your imagination. As they are brought down into the chakras that govern the physical, you may allow yourself to bring them into the reality of your existence. This is where the strong energy of creativity that this stone embodies may aid you. It is not a comfortable stone to use for long and takes a bit of getting used to. This is a powerful experience! If you have found that using Zincite has caused a build-up of anger using Yellow Apatite may help to release it. Yellow Zincite will gently help to allay the symptoms of women who have difficulty with menopause symptoms, and may help you to adjust to the changes in your life. If you want to manifest money or other positive effects you want in your life, combine it with either Heliodor or Golden Yellow Labradorite. It is a powerful tool for manifestation and one effective method that is an excellent action to incorporate with this stone, is to use it in combination with the 7 laws of attraction. Exercise the power of Zincite to manifest those things that you have been imagining. As you use this stone you may unlock your imagination and bring all of the things that you most desire into your life. Zincite crystals are very small, yet they have a strong energy. Even though they are small, they are still very powerful, and must be used in moderation… to avoid negative symptoms caused by overuse. Sometimes you can get too much of a good thing and in this case it is best to be cautious in your use of it. It is a powerful stone to assist you, if used for small periods of time, on a regular basis and this applies to all colours of this crystal. The Crystal of the Day Sunday 20 October 2013 is Orange Millenium. This wonderful orange gemstone has come up from the depths of the Earth and lain on the high desert floor, waiting for mankind’s need for a balancing agent to help shift your physical body into a more comfortable place to be. As the emotional winds of change buffet us through the Earth changes that are upon us, these little Orange balls wield the power to calm the survival fears that effect the lower 4 Chakras The fears that tend to keep us off balance and feeling alone, vulnerable to attack, loss, powerlessness. The root causes of the victim consciousness that seems to permeate the World today, and that creates a self fulfilling prophecy of doom; Letting one face there greatest fears, but then not walking through them. Carrying Orange Millennium™ on your person can greatly help both seeing and feeling that these fears are just that fears, enabling you to feel a sense of calm in the storm. Helping the body to not react to the reptilian brains fight or flight syndrome, by lessening the bodies need to produce chemical stimulants that create “SUPER STRESS” that rob your energy and create a lethargic feeling along with sleeplessness, bizarre dreams, odd and disturbing visions of a future that holds NO future. Constipation of both the digestive tract and the emotions are greatly helped with Orange Millennium™, relief is brought by the knowingness that you are a child of the Earth and are connected to Her core; you are here to witness the Earth changes and be changed by them, that you are safe going through these changes if you let it be safe. With the help of Orange Millennium™ you are able to let the body unwind, the bodies mind drop its shield and feel a deep sense of belonging to this Earth helping Her in Her time of need. For She has a need for those that would project good well and well being. One drop of light in a dark room will change the way all in the room perceive it, creating the beginnings of soothing life giving energy. Orange Millennium™, like it’s forerunner Green Millennium™, works with creation of Transforming Non Cohesive Energy flow into Cohesive Energy Flow within the Body ; but does so by accessing the bodies mind to release the hidden fears stored there in both the Solar plexus and the Root Chakras It will help ones sexuality and fulfillment in many Root chakras areas, lessening the feeling of neediness and lack. Copyright © 2002 Laurence R. Hargrave. All Rights Reserved. Used with Permission. Orange Millennium is natural Carnelian nodules so they also have the energy of Carnelian. ** I’m sorry today’s information is so late, was at hospital 🙂 I’m fine. 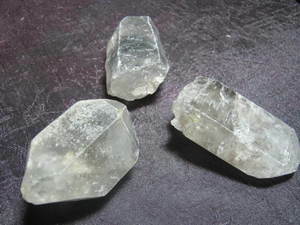 Novaculite is used psychically to cut psychic or etheric cords. It can also be helpful for “cutting through” problems, getting past problems, and finding solutions. Novaculite is useful for alleviating depression and despair. 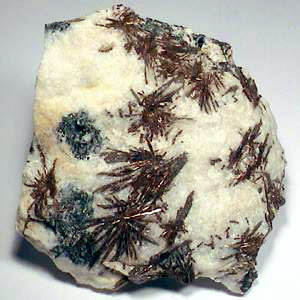 Physically novaculite is used in crystal healing for clinical depression, obsessive disorders, warts, and moles. Novaculite energizes all the chakras. The Crystal of the Day Sunday 13 October 2013 is Boji Stones. Boji Stones® come the base of a natural pyramid mount in Kansas, the centre of the continental USA. Boji Stones® usually come in pairs, a smoother stone which has Yin or female energy and is referred to as the female, and a rougher stone that has Yang or masculine energy and is referred to as the male. They are excellent for balancing energy and polarities of all kinds. They are used a lot in energy healing and psychic healing to release blockages. They are also often used to balance the chakras and align them. Boji Stones® are excellent for grounding excess energies, grounding people who are feeling “spacey”, and for shielding. In the both the household plant pots and out in nature, Boji Stones® are used to promote plant growth. Boji Stones® are also used in crystal healing for arthritis, back pain, general healing, regeneration of cells, adrenal glands, chronic fatigue, and physical energy. The Crystal of the Day for Tuesday 1 October 2013 is Botswana Agate. Botswana agate is sometimes called the “change stone” because of its mystical property of helping one handle change in a positive way. It is said to gently help one make transitions of any kind in a way that change is not as difficult or painful as could be without it; it is a comforting stone. Carrying a bit of Botswana agate in your pocket is said to help one cope easily with the minor changes that life throws at us daily. 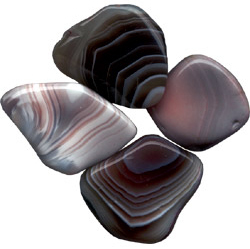 Relief from depression and/or grief is another metaphysical energy of Botswana agate. It is said to help us focus on solutions instead of problems, and thereby increases creativity, as well as increasing the power of one’s intuition. Botswana agate is noted in crystal healing to be helpful in overcoming addictions and other self-destructive compulsive behaviour patterns, as well as dealing with repressed emotional issues. As a success stone, it is said to help one achieve and cope with success. It is also a stone of sensuality. In crystal healing it is said to be beneficial to the nervous system and can help rid the body of toxins, as well as help in the healing of broken bones. Because of the harmonising qualities of agate, and its emotional energies of removing and releasing resentments and bitterness, it is also considered by many to be an excellent stone for helping to heal and improve relationships. Agate can cleanse and stabilise the aura by removing and/or transforming negative energy. Physically, agate is particularly helpful with tooth and gum issues, stomach problems, physical endurance, and insomnia. Crystal of the Day for Monday 30 September 2013 is Binghamite (American Tiger Eye, Silkstone). Binghamite is a stone that is said to bring all manner of good things, particularly good fortune. It is also said to have the energies of faeries and elves, which is a very positive energy. In crystal work, Binghamite is used to communicate with the inner child. It is also used by metaphysicians for clairaudience and communication with other worlds. Physically, in crystal healing lore, Binghamite is used to regenerate energy flow in the body, renew cells, eases disease, Theta brain wave patterns, burns, convulsions, anemia, and ear nose and throat problems. Binghamite is also used in crystal healing to energise and direct other minerals energies.. The Crystal of the Day for Friday 27 September 2013 is the Empathic Warrior Crystal. Empathic Warriors are recognised by damage to the crystal’s points and/or sides. These crystals may have at one point had great power, but now are damaged. Properties Lore: Empathic or Empathic Warrior crystals are some of the strongest crystals as far as energy. They have seen their own battles and come through them alive, bringing energy of strength and empathy for dealing with challenges and injury. These crystals are excellent teachers that true beauty comes from within. As empaths, they energise increased compassion for others. Empathic Warriors are also fabulous crystal healing tools for passing on energy healing without losing one’s sense of self. The power of an Empathic Warrior cannot be predicted. Often when a power or sense is damaged, another grows to compensate. One can only experiment to determine what power and use an Empathic Warrior may have. Empathic crystals are considered a good working crystal for use on oneself or for human clients or animals experiencing change, transition, feelings of loss, fear, or grief. They are considered especially useful on those who have been abused at any time. Empathic crystals also help balance yin (female) and yang (male) energies. 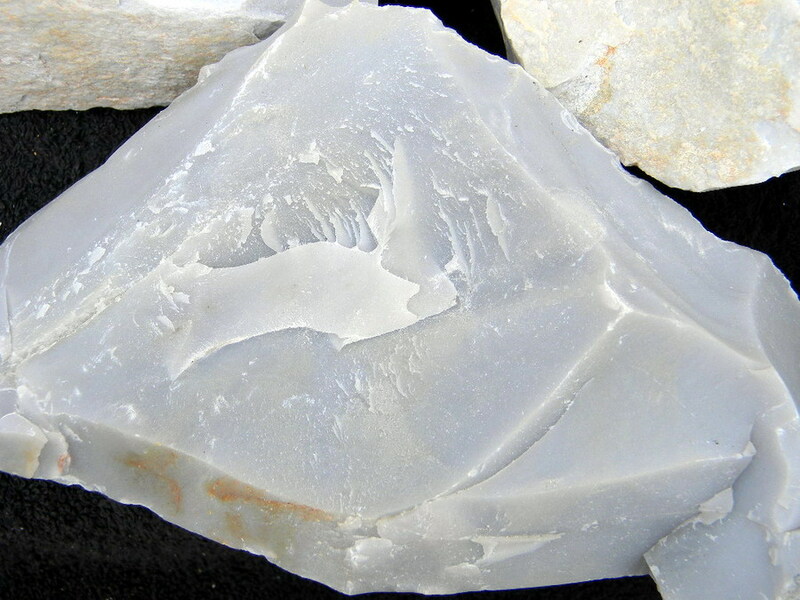 Be cautioned in overlooking a “damaged” crystal, rather consider that its power may not be readily visible. If you encounter such a crystal and it seems to be attractive to you, it may be worth your while to explore its abilities. You might be quite surprised and pleased by what you discover.. Crystal of the Day for Monday 23 September 2013 is Fulgurite. Fulgurites are natural glass, usually tubular, formed by lightning strikes in sand or rock. Fulgurites are high energy formations due to the nature of their birth. They are particularly noted for their ability to channel and direct energy. Fulgurites have been used to communicate with aliens and entities, or ascended beings in the spirit world. They are often used for clairaudience. This crystal enables you to master your clairaudient abilities and creates the ability to perfect yourself as a clear channel. This enables you to access universal knowledge and to connect intuitively with guides and Masters. 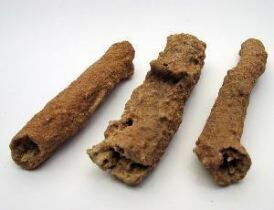 Fulgurites are also used to enhance communication in the physical world, and are used as stones of leadership. Fulgurites are used by Native Americans to bring rain (cloud-bursting), and as charms for protection from lightning. Weather-changing of any sort is not recommended, however, unless, as with the Native Americans, one has an exceptionally good sense of the balance of Nature. Physically, fulgurites are used in crystal healing and in treatment of the immune system, ear, nose, and throat ailments, sight, thymus, tumours, growths, and colon.